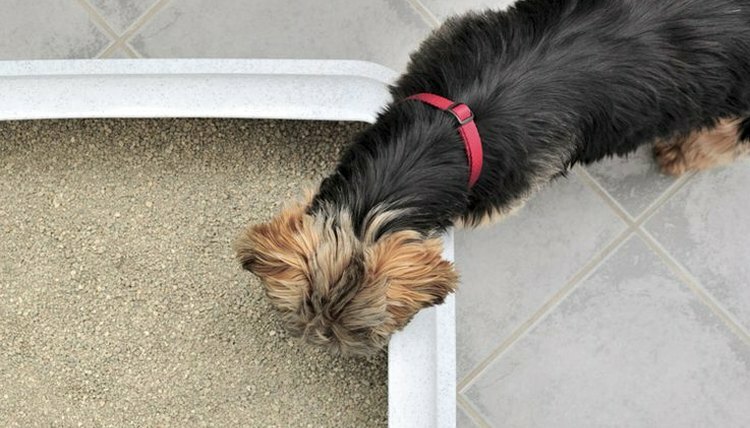 If you've got both a dog and a cat, your pup may have perfected the art of swiping what he deems to be "tasty treasures" out of your cat’s litter box. Yes, for reasons mostly unknown to humans, most dogs love to munch on cat poop. However, with your help, Fido can break this unsanitary habit! There has only been speculation as to why dogs treat cat poo like petit fours. If your dog is a puppy, then it's common for him to chomp on anything he can get his mouth around--including the cat's and his own poop. Others believe that the act of poop eating (called "coprophagia") in dogs may be the result of anemia, malnutrition, endocrine disease, or other medical issues which may compel the dog to "supplement" his diet. Some believe that dogs do it out of boredom. There is also some evidence that because cat poo contains high levels of dexycholic acid—something which a puppy needs for normal neurological development—dogs are instinctively drawn to the nasty stuff. Or, there's always the simplest answer: dogs just like how cat poop tastes! The most effective way to keep your dog away from Kitty’s litter box is to place it in an area that will be challenging for him to reach. If you have available space, you can raise the litter box onto a counter or some other elevated space where the cat can access it but the dog cannot. If that's not an option, you can try blocking your dog’s access from below using a plastic baby gate. If you have a small dog and your cat doesn’t have mobility issues, set up the baby gate low to the ground so that Fido can’t get beyond it and Kitty can simply hop over it. If you have a big dog, you can raise the baby gate to leave a small opening underneath it that is big enough for your feline friend to crawl under but small enough to stop your big pooch from getting through. While the idea is to keep Fido out of the litter box, ensuring that Kitty can easily access it and is comfortable with the location is also a crucial part of strategic placement. Since the unwanted behavior is reinforced every time Fido successfully finds a “snack” inside the litter box, scooping the litter box several times a day will significantly reduce his chances of scoring a prize. If you are unable to clean the litter box multiple times a day, consider purchasing a self-cleaning litter box. Automated litter boxes are pricier than the more traditional ones but they are a big help in keeping Kitty’s box clean and reducing Fido’s odds of reward. Use litter box designs and accessories to your advantage. Sometimes a box cover is enough to deter Fido from going litter diving. There are many styles of litter boxes that are designed specifically to discourage or stop Fido from snacking on litter treats by making it harder for him to reach inside like those with small openings on the side or at the top. Though mostly on the pricey side, there are stylish and sturdy litter boxes that also serve as furniture which also carry added benefit of keeping Fido out. Explore your options on the litter box market to see if you find one that suits your needs. Kristina de la Cal is a full-time teacher who has been freelance writing since 1991. She published her first book, “Breaking up without Breaking Down," in 2007 and specializes in a variety of topics including, but not limited to, relationships and issues in education. She earned a Bachelor of Arts in Psychology from Florida International University.